Redemption: Word Made Flesh. 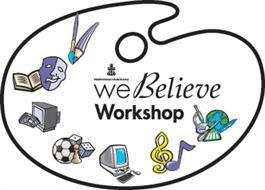 Based on rotation style of learning We Believe Workshop curriclum is based on the tenets of the Reformed faith. The Leader to Leader section provides biblical background, theological connections, educational emphases, and ways to welcome all children. Each unit contains the following thematic workshops, each sold individually: art, audiovisual, computer, drama/storytelling, games and puzzles, music and worship.